12964 Sapper Arthur White of the 11th Field Company, the Royal Engineers. Son of Arthur and Mary White (née Walters) of Alder Quarry, Lewdown; brother of Bert ("Bertie") (see below). Born in Lewtrenchard in the March Quarter of 1885. Died 14 July 1915 aged 30. Lieutenant Frank Maitland Carver of "A" Company, 8th Battalion, the Devonshire Regiment. Son of Frank and Leila Carver (née Baring Gould). Born in Paddington in the March Quarter of 1894. Died 25 September 1915 aged 21. Educated at Wellington College, Oxford. 15246 Private Bert White of the 9th Battalion, the Devonshire Regiment. Son of Arthur and Mary White (née Walters) of Alder Quarry, Lewdown; brother of Arthur (see above). Born in Lewtrenchard in the June Quarter of 1883. Died 25 April 1917 aged 33. 18986 Private Ronald Dawe of XIX Corps Cyclist Battalion, the Army Cyclist Corps. 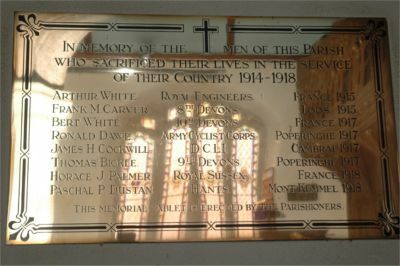 Son of William Henry and Emily Dawe (née Turner) of Lewtrenchard School, Lewdown. Born in Lewtrenchard in the June Quarter of 1893. Died 19 June 1917 aged 24. 28852 Private James Horrell Cockwill of the 7th Battalion, the Duke of Cornwall's Light Infantry. Son of John and Ellen Cockwill (née Down). Born in Lewtrenchard in the March Quarter of 1888. Died 21 November 1917 aged 29. 25735 Private Thomas Bickle of the 9th Battalion, the Devonshire Regiment. Son of James and Maria Bickle (née Tredinnick), of Liddaton; husband of Mary Jane Bickle (née Hitt) of Holster-Yard, Marystowe. Born in Coryton in the June Quarter of 1885. Died 26 October 1917 aged 37. Also commemorated on the Marystowe Memorial. 2nd Lieutenant Horace J Palmer of the 7th Battalion, the Royal Sussex Regiment. Son of William and Mary Palmer of Foxcombe, Lewdown. Born in Lewtrenchard in the September Quarter of 1892. Died 8 August 1918 aged 25. 45612 Private Paschal Palmer Dustan of the 15th ( Hampshire Yeomanry Battalion) Hamphsire Regiment. Son of Charles Henry and Eliza Dustan (née Gerry) of Lew Quarry, Lewdown. Born in Lewdown in the June Quarter of 1899. Died 9 August 1918 aged 19.